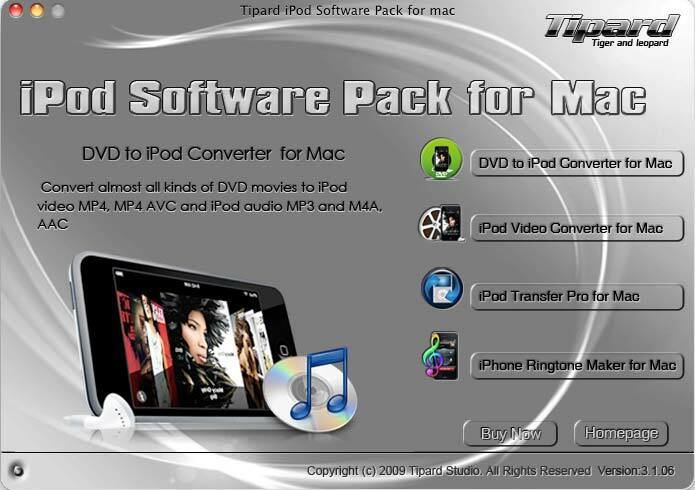 Tipard iPod Software Pack for Mac is the professional Mac iPod software to convert DVD/video to iPod, transfer iPod files and make iPhone ringtone. This iPod Software Mac actually includes DVD to iPod software, Video to iPod software, iPod transfer software and iPhone ringtone maker for Mac.With this Mac iPod software, you can convert DVD/video to iPod MP4, MOV, M4V, H.264 (.mp4) video and MP3, AAC, AIFF, M4A, WAV audio. To convert DVD/video to iPod, transfer iPod files and make iPhone ringtone. ...... loss. Create iPhone Rintone M4R from any video/audio sources for the newly updated iPhone OS 3.0. You can set the output Video Encoder, Resolution, Frame Rate, Video Bitrate, Audio Encoder, Sample Rate, Channels, Audio Bitrate. For Resolution, you can input your own parameters according to your needs. For the well-customized profile, you can save it as the User-Defined profile for later use. Adjust video effect - Brightness, Contrast, Saturation and Volume (Deinterlacing). Get any clips from source file. Crop the aspect ratio and join several files into one file. For you to rip DVD, choose audio track and subtitle for the converted files. Easily import video/audio files to iPod directly without iTunes. Backup iPod music/movie files to Mac quickly without any loss. Qweas is providing links to Tipard iPod Software Pack for Mac 3.2.30 as a courtesy, and makes no representations regarding Tipard iPod Software Pack for Mac or any other applications or any information related thereto. Any questions, complaints or claims regarding this application Tipard iPod Software Pack for Mac 3.2.30 must be directed to the appropriate software vendor. You may click the publisher link of Tipard iPod Software Pack for Mac on the top of this page to get more details about the vendor.